The Polisario Front is plunging further and further into the quicksands of the Algerian desert. A new complaint has just been filed against the separatist front with the European Parliament and the European Commission, by Spanish and European NGOs, which accuse it of diverting Humanitarian aid destined to the populations of the Tindouf camps. According to these NGOs, European aid continues to be plundered by Polisario leaders who have made of it a source of illicit enrichment. In a complaint filed with the two EU institutions, White Hands NGO ensures that humanitarian aid is the subject of a well-organized robbery, stating that 90% of the products reaching Tindouf are resold in black markets in northern Mauritania and Mali, and even in Algeria. At the same time, a Spanish union filed another complaint against two Spanish NGOs called “Friends of the Polisario” and “Euskadi” as well as against the leadership of the Polisario, which it accuses of having diverted more than €3.3 million between 2008 and 2015. 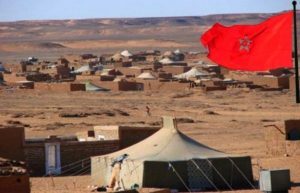 The assistance was granted by Basque public institutions to the 40 thousand Sahrawis or so forcibly detained in the Tindouf camps by the separatist Front with the blessing of Algerian authorities. Since they created the Sahara conflict during the Cold War era, Algerian authorities have used this issue in their attempts to weaken Morocco and fulfil their hegemonic ambitions in the region. But all their maneuvers failed despite the large financial and diplomatic means they mobilized to this end. Algeria and the Polisario, which have also failed to block the return of Morocco to the African Union, continue to suffer setbacks in their diplomatic battle with Morocco over the Sahara issue. The Polisario suffered its latest failure at the Spanish Senate with the rejection of a motion that was presented by a group of small parties of the Catalan Republican left asking the government of Mariano Rajoy to recognize the so-called Sahrawi republic “RASD.” Another fruitless attempt by the Polisario, its Algerian mentors and their lobbyists.